I have a Livernois stage 4+ tune and a K&N Typhoon CAI. No idea if the CAI really helps or not. I just love the sound and BOV noise I hear with the K&N. The Livernois, on the other hand is an amazing transformation. I need to update my signature too. I have been hitting 4.30 to 4.36with some regularity lately. Likely attributable to cooler temps and. the car being more broken in. I would be very very happy with a 5 second 0 to 60 Enclave. Man, I'd like to drive your car at some point. I drove a stock Taurus SHO, and even though I only got to do a 2nd and 3rd(?) gear rolls, I wasn't super impressed. I'd be interested to see how much quicker yours feels, because it's a car I want to like. Mine stock was about 5.2. So the tune and associated increased boost took almost a second off...almost. Its real noticeable. And if somebody puts less than premium gas in even stock, you will also notice a difference. Cold air= more room for oxygen molecues=more power. Livernoise does a good job on tuning & I suspect your CAI helped a bit also. One thing you have to remember is that you have to pay to play. That camaro video is actully impressive, Granted its " slow " for what one would expect by reading TWIN TURBO" but the camaro is a PIG.. The 11 SS convert we had was very slow, to be honest it was the slowet car we had... Took it back to GM said it was slow, they did some test and said it was fine, the car was traded back in 300 miles later..
Now if they where to do that twin turbo kit on a impala, or a single i bet the times would be more impressive.. A few years ago car tuning out of canada made a kit for SS impalas, it was $$$ but made a lot of power, I think they all ended up having transmission issues.. I two would love a turbo on the company car but i just dont see it working, at the end of the day lest say that a kit only ads 100 hp, an extra 100 in fwd is a major traction issue lol..
You guys ever tried to bolt on that CTS-V supercharger onto a denali or Slade? For any turbo kit i bet you lookign at over $5K, that would be hitting between the cheap stuff that will not last a long time and the show stuff that no one care about. Think about the parts you would need..
9) relocate crap, so new bracets or componets. Wouldnt you think if your car is flex fuel and you want to go the turbo routw you wouldnt need fuel injectors and a fuel pump since your car can run e85. most racers run e85 or water and meth kits. "2011 Chevy Impala 3.5L V6 metallic ICE"
EVER SINCE WE WENT TO THE "NEW LAYOUT" THIS FORUM HAS SUCKED. KERR, as I think you know, I also have had several Tahoes (99 and 01) as well as a 2007 Lade. Hands down, the Lamdas have more USABLE passenger room. And with 3rd row seats up, more usable room behind the third row. It defies logic when you look at the two side by side or compare exterior dimensions. We can fit 6 in the Enclave much more comfortably than a full size GM SUV (regular length) - due in part to the sliding rear bucket seats, as you mentioned. 7 in the Enclave is still a pinch, but better than the Tahoes/Yukons/Escalades. Only thing that would be nicer is the kind of performance numbers that are being discussed here. 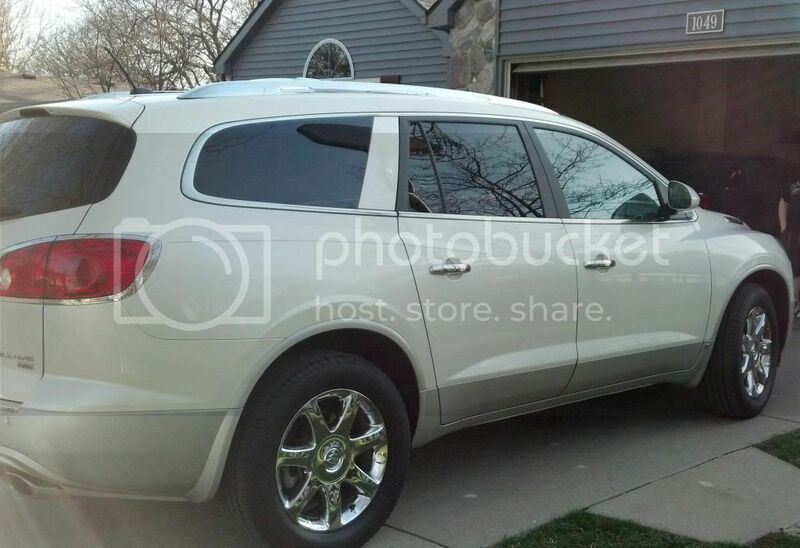 Never thought I would like a BUICK Crossover so much. If somebody is regularly transporting more than 6 passengers, a Suburban/Yukon XL/ ESV is the way to go IMO. Last edited by TSS; 11-26-2013 at 11:55 AM. On the Direct Injection engines you don't change the fuel pump or the injectors....both are more than able to provide fuel into the 450-500 hp range. On average we usually end up in the 450-500 hp range on these. A complete turn key build, tuned and installed is usually around $6900...pricy as the cost of the Impala is low compared to many cars. When we go over 500 we add an additional fuel delivery system on top of the OEM system (traditional injectors are added to the intake ports, separate fuel pump & regulator, and stand alone controller for it). We have only gone to just under 700 hp, but another shop has made 800 hp & 850 some tq with twin turbo. They broke a minor part in the auto trans, but replaced it and it has held up so far. They are around 20# boost. So $6900 to turbo an impala? Correct? 1 - IMHO that is a bit over-priced considering intercooled kits to do Grand Prixs are like in the $3900-$4500 range. DIY brings that down to around $2200-$2500, if you can believe that. 2 - That is THEORY. No one has stepped up and said that they are offering anything for any price... yet. All those amazing pics that SC2150 showed us are all rear wheel drive vehicles, I believe (Camaros, Caddys, etc...). The front wheel drive is no different with the turbo, and were doing a 2014 right now that is AWD. The cost comes down to we use the Borg Warner EFR turbo...the most technologically advanced turbo system in the world currently and the turbo alone is nearly $2000. You can get a $150-$250 ebay cheapo, but when they come apart the engine usually goes with it as they don't do well ingesting the metal pieces. So yes, you can find complete turbo kits online for even under $2k total....but you have a china BOV, waste gates, etc. so you get what you pay for. Were using all top quality parts that can easily be substituted for cheap china stuff if that's the route someone wants to go, but we wont scrimp at the expense of longevity and the engine. We get a steady stream of blown up cobbled together systems to redo correctly and replace engines in. Turbo charging a car you value is not a place to scrimp and cheap out on. As far as FWD, we turbo charge most any vehicle as long as we can tune it......just very few FWD GM owners stepping up. But yes, someone with the skill and time and fab equipment could do their own in the $2000-$3000 range with cheap parts for sure, and just searching the internet I see some pretty dang good examples of DIY builds that do last and make good power. All in the persons ability. Same with an engine repair done by someone themselves may cost $1000 or less (depending on the repair) where a dealer may charge $6-8-$10 k for the same thing. So correct, no specific kit for these yet as the demand would have to be there to invest the amount of $ and resources for jigs, etc. The ones I do are all custom one off for the non-mainstream systems.